When you get to the tail end of wedding planning, you don't want to make any more decisions. You're at the point where you just don't care what is played when you cut the cake as long as the cake you ordered shows up and people eat it. But when the band or DJ asks what song you want when you cut the cake, you can't say, "I don't care." Although I Don't Care by Fall Out Boy is actually song, it's probably not what you meant. You just, quite simply, don't care. But you can't tell the band of DJ that. You can't just say, "Play whatever" (Even though Whatever is a song by Oasis). You have to decide. Because that's part of wedding planning. You have to make decisions, regardless of if you are tired of making them or not. 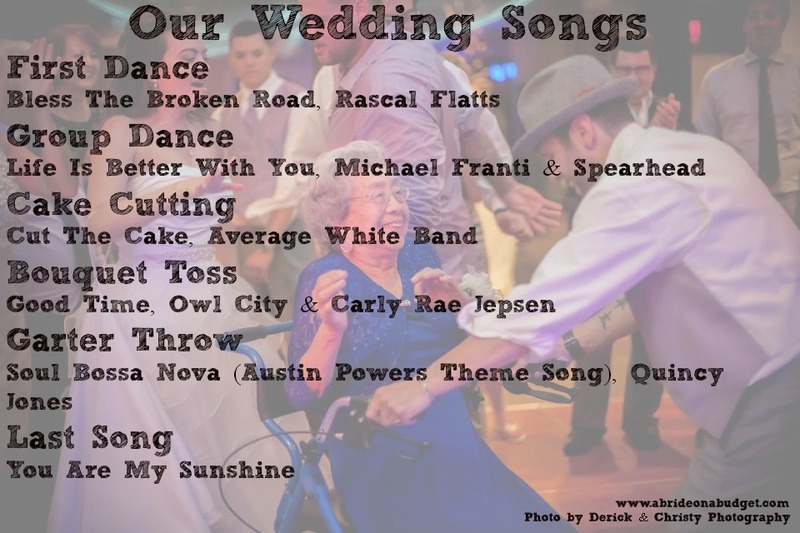 To try and help you out, I put together a list of the songs that we picked for our wedding songs. I already agonized over this and never ended up with "I Don't Care" (which could result in you getting that awful Icona Pop as your first dance). BRIDAL BABBLE: What are your wedding songs? Great choices! I love how you added video for each song. I'm sure everyone had a great time! Some great song choices. I especially love The Broken Road, it would have been my choice of first dance song if my friend hadn't gotten to it before me. :) Still we ended up with Rainbow Connection and it was perfect for us. That is a great pic of your funny grandmom and Pete! Ive always loved Bless The Broken Road!